Hey there, Exalted fans! 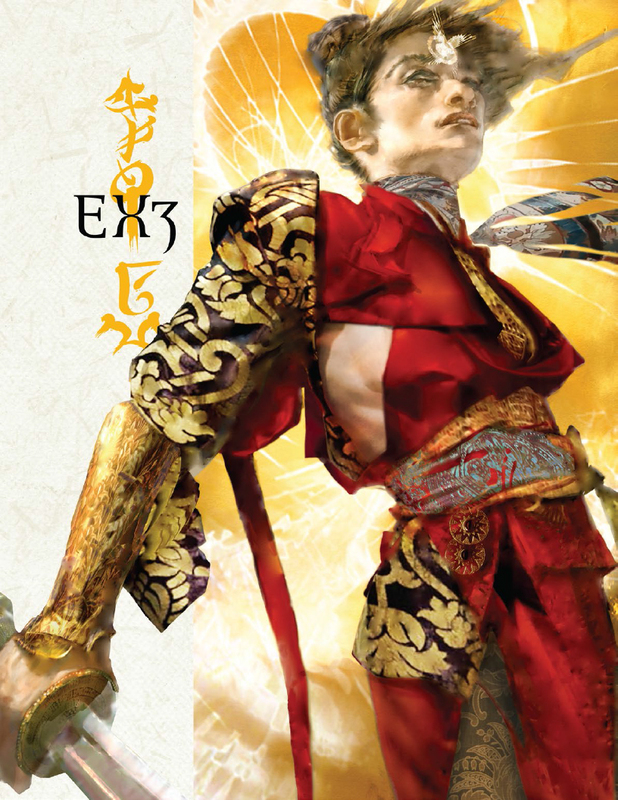 We’re here to talk about how (and where) things are going with Exalted Third Edition. First off, the Dragon-Blooded Kickstarter was a smashing success thanks to the passion of its backers. At $331,392, it’s one of Onyx Path’s all-time largest Kickstarters, despite being a supplement rather than a core book. Needless to say, that’s far beyond our wildest expectations! Thanks to all of your efforts, more Kickstarters for deluxe editions of other splatbooks seem very likely. We’re enormously appreciative of your trust and efforts in making this possible, and we’re looking forward to the next one. In the wake of the Dragon-Blooded Kickstarter, we’re working on Heirs to the Shogunate, the companion volume to What Fire Has Wrought. Compiled from unique reward tier purchases and stretch goals unlocked during the Kickstarter, it’ll cover a wide range of material: Realm cadet houses, guides for secondary school games, Lookshy, Prasad, the mysterious Forest Witches and possible paths to the Realm Civil War. It’s also going to feature custom Charms and artifacts requested by backers, and we can tell you that they’ve got some absolutely awesome ideas. We’re just finishing up the Heirs outline, and we hope to start working on it later this year. Right now most of our attention is dedicated to Lunars: Fangs at the Gate. We’re aiming to present a clear, coherent vision of Lunars that makes them an essential, irreplaceable part of Exalted’s setting. They are the divine monsters that Luna unleashed against the enemies of the gods, shapeshifting tricksters and world-walking witches, sacred beast-god guardians and terrifying horrors that stalk the night. Driven to the edges of the world by the Dragon-Blooded Shogunate and its successor, the Realm, the Lunars have fought tooth and nail to tear down the world-spanning empire that seeks their blood — and they are winning. Lunars: Fangs at the Gate lays out the Silver Pact, the mutual aid society that protects young Lunars from the Wyld Hunt and which organizes the centuries-long war against the Realm, detailing prominent elders within the Pact — including both familiar faces like Ma-Ha-Suchi and Leviathan, and brand new characters — as well as Lunar dominions under the Pact’s control, fully detailed settings ready to use in a player character’s background or as adventure locations for the Storyteller. And of course, it has all the mechanical support needed to play a Lunar. It provides comprehensive rules for Lunar shapeshifting, and a better-than-ever set of Lunar Charms, with new features like the Protean keyword, which grants you upgraded effects while in certain animal forms. There’s also a variety of Martial Arts styles both new and old, such as Centipede style and Swaying Grass Dance style; new sorcerous initiations and spells; a panoply of moonsilver artifacts with Evocations; and stats for a menagerie’s worth of animals to shapeshift into. We’re officially announcing another book we have in the works, Across the Eight Directions, a setting book that’s a spiritual successor to the first-edition favorite, Scavenger Sons. This will be a hefty volume of setting material that spans the entirety of the Threshold. It’ll encompass over 40 distinct locales and peoples, each surrounded by a constellation of more neighboring locales that provide context and texture, making it clear that these places exist as part of the fabric of a living, breathing world. Some trace back to the Exalted First Edition core book, like Nexus and the Varang Confederacy; others have appeared in later editions or in the Third Edition core book, like Ysyr and Volivat; and still others will appear in Across the Eight Directions for the very first time, like the raksha-ruled city of Amaryllis and the eerie Lost Isles of Aiun. And, while it’s still far out on the horizon, we can finally announce the full title of the Exigents book. It’s Exigents: Out of the Ashes, and it’ll give you everything you need to play characters like Strawmaiden Janest, create your own Exigent, or even create a new type of Exalted, like the mind-devouring Hearteaters, the haunted Umbral Exalted, and the reality-warping Dream-Souled. If you’d like to be a part of creating this next wave of Exalted material for Exalted Third Edition, we have a process for that! Go to the Submissions Guidelines page and follow the instructions there on submitting a text sample, along with a disclosure form. If it’s been at least a year since you last submitted and you think your work has improved or would fit any of these projects, feel free to submit again with your most recent text sample. We hope you’re as excited by this rundown of what’s up in Exalted Third Edition development as we’ve been getting to work on it. Take care, and feel free to leave questions both here and on the Onyx Path forums! Awesome! Thanks you folks for all your hard work! This is amazing news! Thanks for taking the time to update us and keep up the good work. Are submissions open for artists as well? Fantastic! Thank you so much for all of your hard work. Is there any chance to put out a version of the Bestiary/Antagonists in a comprehensive book? I thought I heard something about that, but I wasn’t sure when that was. Yep, they’ll be compiled once the releases are complete. A compiled book has always been the goal after we have enough of each to make for some decent sized books, so you heard correctly! Great to hear about the progress on Lunars (and Exigents!). I’m also happy to see that there’s still a place for herbivore-oriented Lunars. Some of the concepts I heard early on made it sound like they were all predators, and I feel like there’s a lot of mileage to be had in bulls, rhinos, giraffes, and even mice. Mice aren’t herbivores, not by a long shot. Whoa! So much awesome in one post! That Eight Directions book sounds incredible, and of course the Exigents book is going to be one of the coolest things ever added to the Exalted universe! The Lunar stuff sounds like it’s going to make my day! By the way, I loved Eska of the Seven Blades (a little late checking it out, I know). That’s a very cool direction for some Lunar goodness! I didn’t have the money available to back the Dragon-Blooded Kickstarter. Is there any way I can still back it at PDF+POD level as I don’t want to miss out??? Dragon-Blooded will eventually be available for preorder on BackerKit. Failing that, you can wait for the regular release on DriveThruRPG.